Washington, DC — Monterey County has the highest homicide victimization rate for Californians ages 10 to 24, followed by San Francisco County, San Joaquin County, Alameda County, and Stanislaus County, a new study released today by the Violence Policy Center (VPC) finds. The annual study, Lost Youth: A County-by-County Analysis of 2012 California Homicide Victims Ages 10 to 24, analyzes unpublished data from the California Department of Justice Supplementary Homicide Report (SHR) and ranks California’s counties by their homicide victimization rates for young people 10 to 24 years old. This is the fourth consecutive year that the VPC has released Lost Youth. The ranking information presented in the study applies to 2012, the most recent year for which data was available at time of research. Funded by a grant from The California Wellness Foundation, the study also presents in-depth interviews with leaders from three community-based organizations working to reduce youth violence: the Coalition for Responsible Community Development (CRCD) in Los Angeles; InsideOUT Writers in Los Angeles; and Youth UpRising in Oakland. The study also contains a discussion of the trauma that results from exposure to violence at an early age and the need for prevention versus “suppression” strategies in reducing youth violence. The study also finds that for youth and young adults ages 10 to 24 in the state, homicide — predominantly involving a firearm — was the leading cause of death for blacks, the second leading cause of death for Hispanics, the third leading cause of death for Asian/Pacific Islanders, and the fourth leading cause of death for whites. In 2012, Monterey County’s homicide victimization rate for youth and young adults ages 10 to 24 was 23.32 per 100,000, which is nearly three times the state’s overall rate. 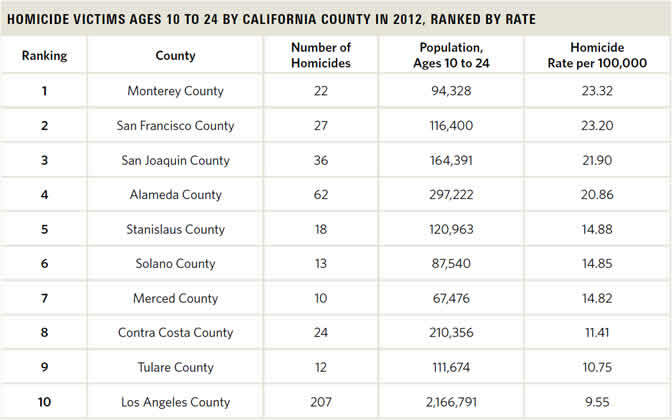 While Monterey County has ranked first in the state for three out of the four years that the VPC has published Lost Youth, its per capita homicide victimization rate for this age group has dropped from 31.24 in 2009 to 23.32 in 2012. In 2011, its homicide victimization rate for this age group was 16.96 per 100,000. Statewide, the homicide victimization rate for youth and young adults ages 10 to 24 in California was 8.06 per 100,000 in 2012. In 2011, the statewide rate for this age group was 7.87 per 100,000. In 2010, it was 8.48 per 100,000. Firearms — especially handguns — were by far the most common weapons used to kill youth and young adults ages 10 to 24. Statewide, of the homicides for which the murder weapon could be identified, 86 percent of homicide victims died by gunfire. Of these, 70 percent were killed with a handgun. In 2012, there were 646 homicide victims in California ages 10 to 24, at a rate of 8.06 per 100,000. Of the 646 victims, 89 percent were male and 11 percent were female. For homicides in which the race of the victim was identified, 52 percent were Hispanic, 33 percent were black, 9 percent were white, and 4 percent were Asian. The homicide victimization rate for black youth in California was 42.37 per 100,000. That is more than 17 times higher than the homicide victimization rate for white youth, at 2.40 per 100,000. The homicide victimization rate for Hispanic youth was 8.70 per 100,000, more than three times higher than the rate for white victims. For homicides in which the victim to offender relationship could be identified, 47 percent of the victims were killed by a stranger. Thirty-nine percent were killed by someone they knew. An additional 14 percent were identified as gang members. The overwhelming majority of homicides of California youth were not related to any other felony crime. For the homicides in which the circumstances between the victim and offender could be identified, 78 percent were not related to the commission of any other felony. Of these, 65 percent were identified as gang-related. For homicides in which the location could be determined, 54 percent occurred on a street, a sidewalk, or in a parking lot. Sixteen percent occurred in the home of the victim or offender, 14 percent occurred at another residence, and 6 percent occurred in a vehicle. To help ensure more stable rates, only counties with a population of at least 25,000 youth and young adults between the ages of 10 to 24 are included. The selected counties account for 99 percent of homicide victims ages 10 to 24 in California (646 out of 651 victims) and 98 percent of California’s population ages 10 to 24 (8,014,360 out of 8,188,043) for 2012.